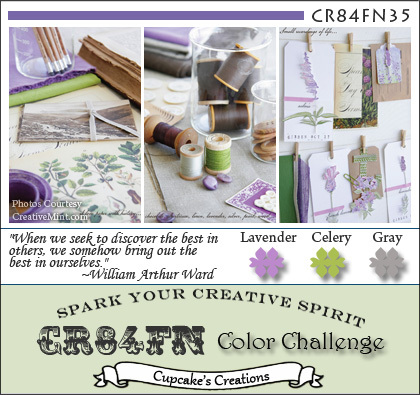 Meljen's Designs has an interesting challenge this week and an easy one. The theme is BLAST FROM THE PAST. We are to show the very first card that we ever made using a Meljen's Designs image! This is the first card using a Meljen's Design that I made for our anniversary on October 14, 2010 and I posted on my blog in this post. Go there to read the details if you wish. Hello everyone. I have a card to share with you. I made this card using a stamp that I bought Saturday at a new store, Michelle's Scrapbooking & More, located now at the Hartville Marketplace in Hartville, OH. You may know Michelle's Online Store by the same name located here and know her from The Pixie Cottage which is her challenge blog and line of stamps. 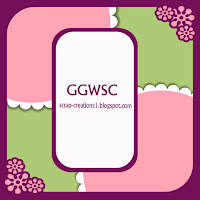 Her new store opened last week and she has a great array of scrapbooking and stamping products. It is great to have her located in the Akron and Canton area and is nice to have another spot to shop for those "must have" products if you are a stamper. That's enough for this unpaid endorsement for Michelle but do drop by to shop with her and say hello if you are in this area. Now back to our main programming. 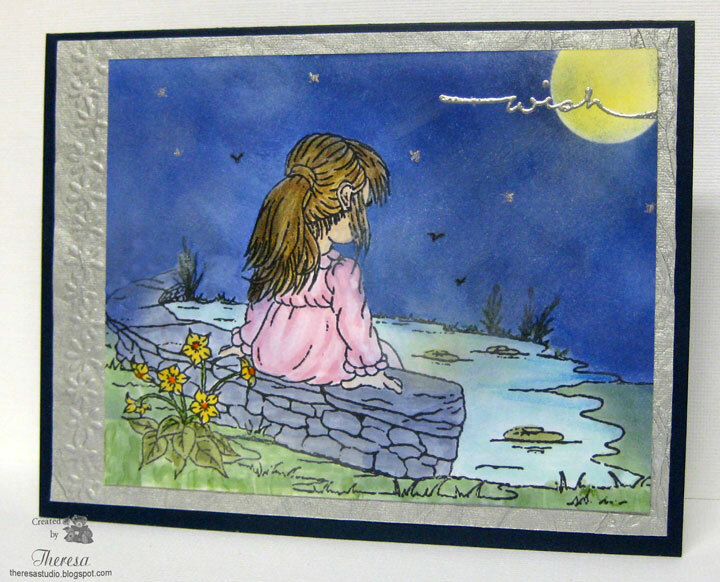 My card is made from The Pixie Cottage stamp called "Hannah at the Pond". Love these cute stamps by Sandra Hammer. I made this for this week's The Pixie Cottage challenge for the theme "Summer Nights". There is also the optional choice to use a sketch. I chose the theme...I could imagine Hannah sitting out at night on a warm evening wishing on the stars . I stamped this in black ink and colored with Copics, markers, pencils and sponged with inks. Did some masking to get that summer sky effect with the moon. Added some sparkly stars. Stamped the sentiment and embossed with Silver EP. Used navy base card and silver mat embossed on the side. 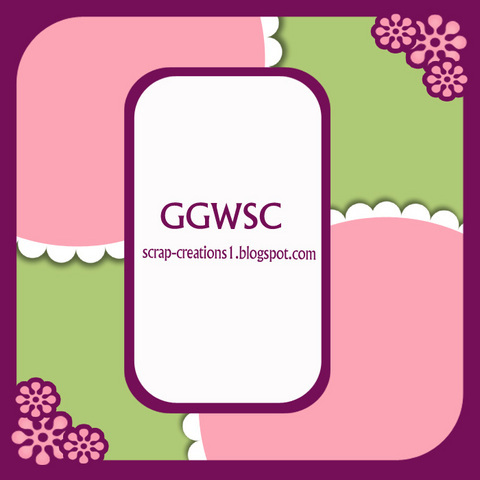 Craft Us Crazy: Anything Goes....and guess who is the Sponsor this week? Hint: Read above endorsement. Paper Cutz Challenge: Wish Upon a Star...those dots in the sky are twinkling stars and Hannah is making a wish. One Stop Challenge: Anything but a square. Nothing square about this card. Stamps: The Pixie Cottage and SU "Wish"
Let's make a scene is the challenge at There's Magic in the Air. 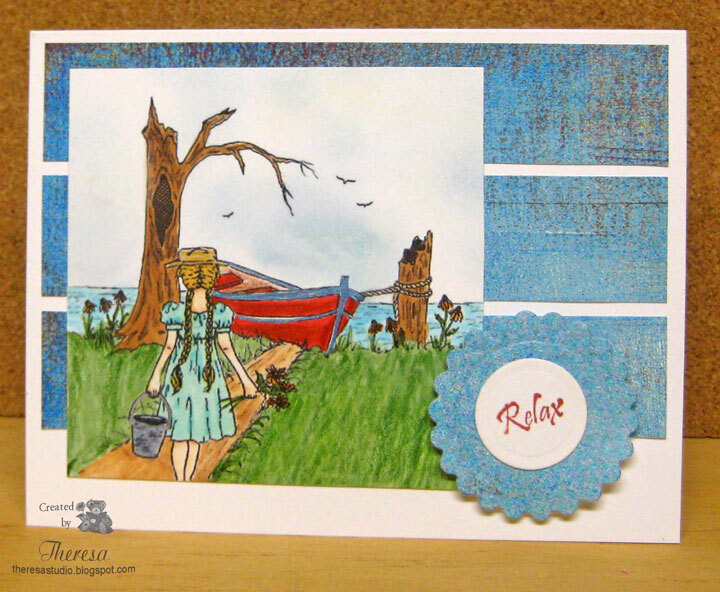 I chose to combine 2 Images from Paper Cupcakes - "Sunny Afternoon" and "Seaside Escape" - to create a scene of a girl walking down to a boat on the beach. I created this through the magic of Photoshop. I won both of these images and it was fun to combine together. After printing my scene I colored it with Copics, Markers, Pencils and sponged the sky. 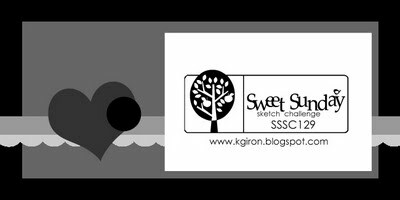 I used a sketch from Sweet Sunday to put the card together but flipped it. Annabelle Stamps will be having a big Birthday Celebration soon. It's time to party because they are turning two! They have a week of celebrations planned and you won't want to miss a day! 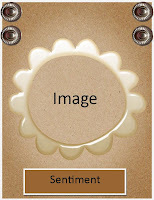 Add the blinkie to your blog and get a chance to win free stamp sets. Check out the dates and all the fun and prizes here. 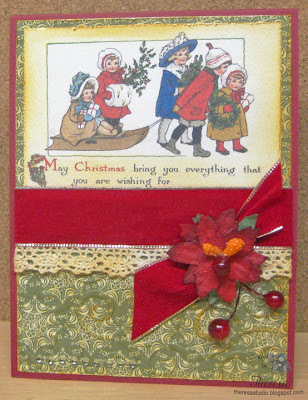 Another card for the contest at PageMaps sponsored by BasicGrey and Flourishes Stamps. I love playing with this sketch. For my second card, I still stayed close to the sketch and used DCWV Citrus Matstack and let the paper do all the work. I cut a flower from one of the glitter papers and used that as a focus and added punched out leaves and stem. Rest was just cutting and attaching coordinating papers with the sketch. 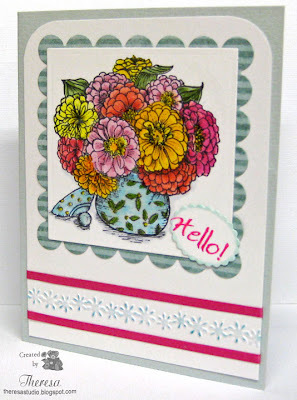 I did stamp a sentiment from Flourishes "Zinnias" to finish the card. Hope everyone is safe if you are in the path of Irene. 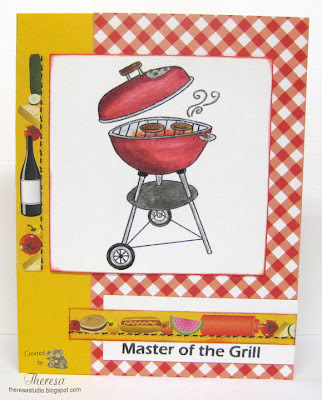 The challenge at Joan's Gardens is to use the tutorial and project done by Heidi Blankenship here to create a card by stamping on pattern paper. I began with a blue pattern paper and stamped in all 13 different stamps to create my design. Stamped several images with Memento Paris Dusk. Stamped other images with Summer Sky and Brilliance Platinum Planet. Added some highlights with a white gel pen on the Lilies of the Valley and did some sponging with Memento Summer Sky. Used liquid pearls on the design in the scrolls. Stamped the verse on another pattern paper and matted on a darker blue CS which I cut both with Labels Four dies. Added some Distress Ink Tea Dye to the verse. Finished with a layered flower of white and yellow silk flowers and topped with a cut out of tulle and gold gemstone. Also added a blue gem stone. Used a card base of navy matted with white card stock. I love how this all created layers of the stamps and added dimension to the card. This design took some time to plan and execute but pleased with the results. Joan's Gardens: Create a card based on the guest designer Heidi's design project and tutorial. What a great card she made for this challenge! 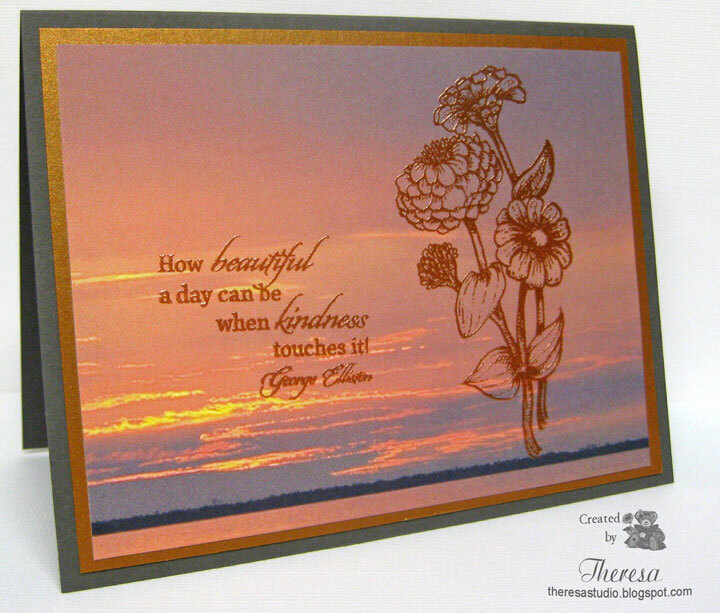 Flourishes Timeless Tuesday: Challenge is all about the sentiment. I was pleasantly surprised that I had also created a card to enter for this challenge when I realized my card really focuses on this lovely sentiment from "Spring Has Sprung". This was a fun project. Can you believe no Copics or Coloring used in the creation of this card? This card proves that one can make a quick card in a matter of minutes if you have a great stamp. Wanted to enter Speedy the Cat's Friends Challenge but I am running out of time. 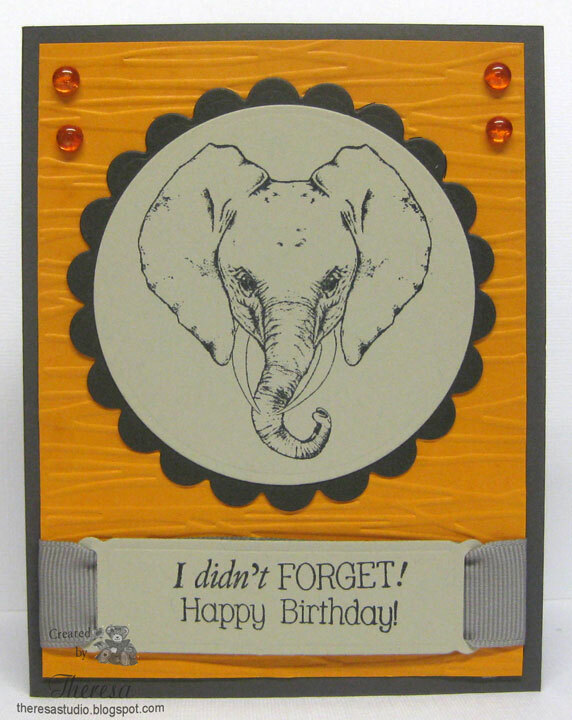 Quickly stamped the Elephant on Grey CS and layered on to an embossed mat and onto the Card base. 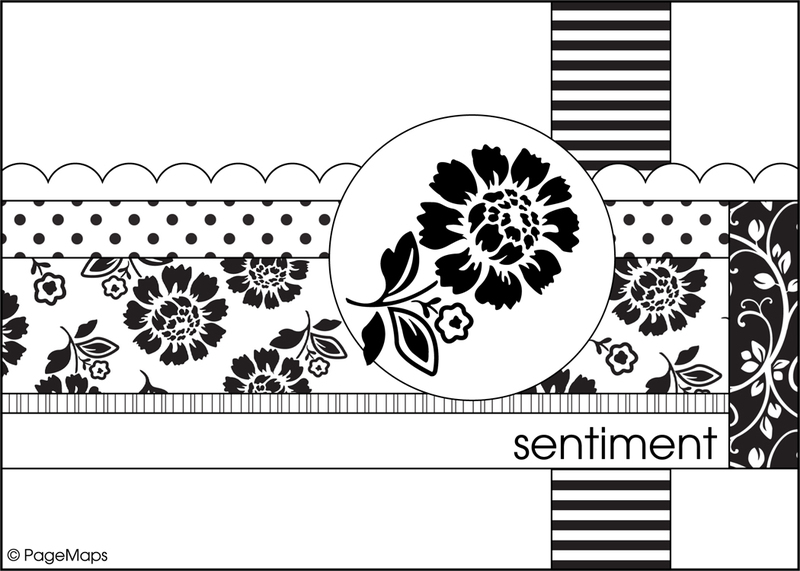 Finished with sentiment and ribbon and dew drops following a sketch from Critter Sketch Challenge. Speedy the Cat's Friends Challenge: Emboss it! Do You Stack Up: Make a masculine card. Stamps: Mark's Finest Papers "African Veldt"
The other day, I came across a link on Flourishes Blog to a great challenge at PageMaps, a new site to me. They are having a contest sponsored by Flourishes and BasicGrey, two of my fave products. 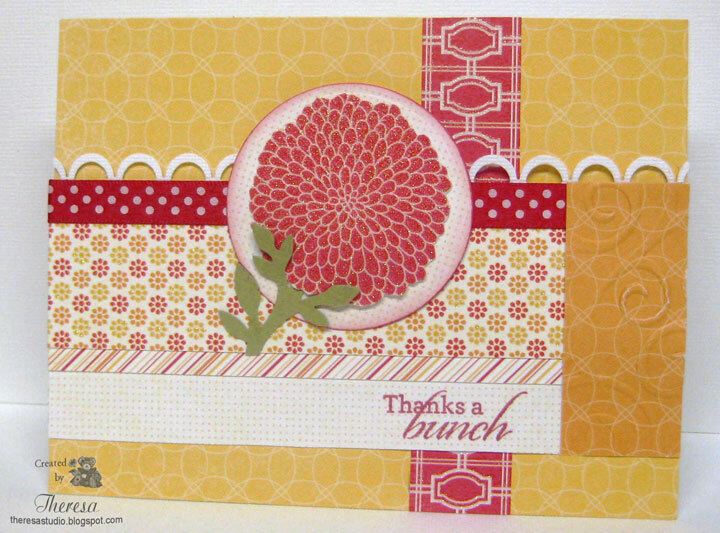 You can win five BasicGrey 6x6 paper pads (Hello Luscious, Life of the Party, Curio, Wander and Lauderdale) and five Flourishes stamp sets (Zinnias, Bee My Honey, Kids Play, Butterflies and Blossoms, and Sunflowers). Fantastic prizes!! 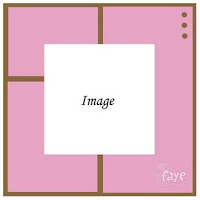 To enter, create a card based on this sketch shown on the right in any size, any orientation, any way you want to interpret it and using any products you would like. I created my card with Flourishes Stamps "A Year in Flowers" and "Humming Along" (sentiment) and BasicGrey Cappella paper pack. Thought: Why not use the sponsors products? Love the way it came out...almost a vintage look. I stayed very close to the sketch and added in some pearls colored with copics and a sheer ribbon to add some softness. I stamped the background strip using the same rose stamp as in my focus rose stamped in London Fog Ink and colored with Copics. I am really happy how this card turned out. Have a great weekend. Be safe if you in the path of Irene. Flourishes continues to celebrate their 4th Birthday. 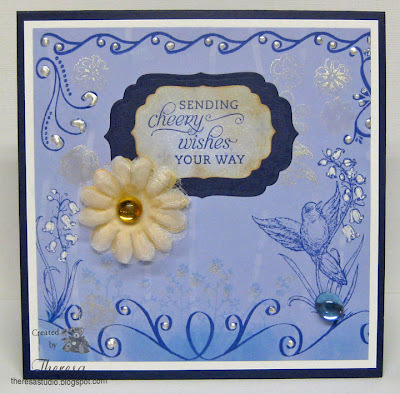 I am joining in the fun by entering this card into their Birthday Challenge to make a card with my favorite Flourishes stamp. Check out all the rules and great prizes here. I have used the Stamp Set "Zinnias" to create a bouquet of colorful flowers. Used many colors in Copics to color the image that I stamped with Black on White CS. Added Glossy Accents to the bowl and lid. 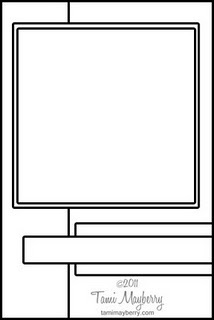 Love to color this image.....so easy with these wonderful stamps. Don't miss out on the fun at Flourishes Birthday Celebration! 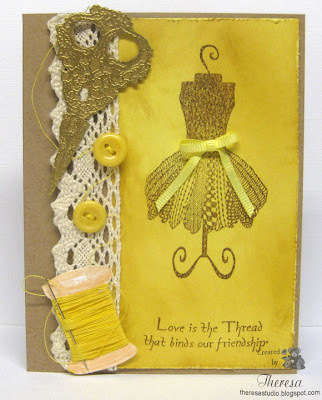 Do the blog hops and enter a card in their challenge. Win some prizes!! Glossy Accents and Glaze Pen. Now more about those wonderful prizes! What can you win? Take a peek at this fun and festive blog candy! Stamp Sets that you can win. If you’d like to learn more about how you can win all of these stamp sets, just click HERE to read up on today’s hop and challenge! You have until September 1st at 5PM CST to enter! If you arrived here by way of Misti then you are on the right path! But if I am your first stop, you’ll want to go back to the Flourishes Blog to start this hop from the very beginning! You will not want to miss any of the amazing projects being showcased. Next up on the hop is….Toni. But before you leave, please write a comment because a lucky winner will be selected from comments left on one of the designers' blogs. A winner will be selected next Friday, September 2nd and announced on Flourishes Blog. Check out all the rules and the ways to win, including a card challenge, at Flourishes Blog. Thanks to everyone who stopped in and left a comment. I'd also like to thank Julie for inviting me to be part of this great celebration blog hop. I wish everyone at Flourishes a "Very Happy 4th Birthday". There's Magic in the Air had a freebie digi from Paper Cupcakes (download before Monday AM) that I used in my card for this week's challenge to use Pink, Brown and White. It seems there are some other challenges this week with a theme of Down on the Farm....which is a natural for this digi of a Chicken called "Bee-Ware". 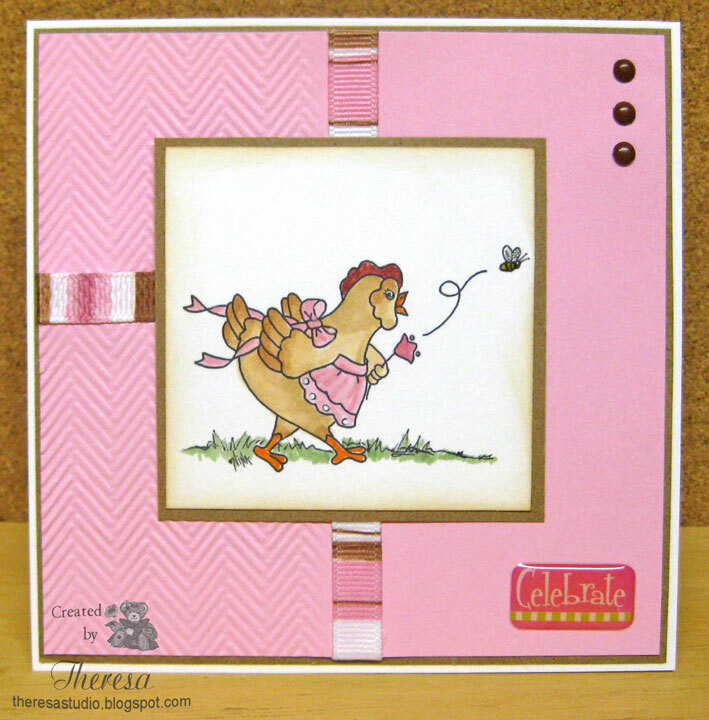 I colored the chicken with pink and brown Copics that I had printed on white CS and cut out with Nesties Square. The sketch I used from Cupcake Craft was perfect for my card...even the sketch was done in pink and brown....color coordinates with my card. Found some great ribbon in my stash that is in the perfect colors. 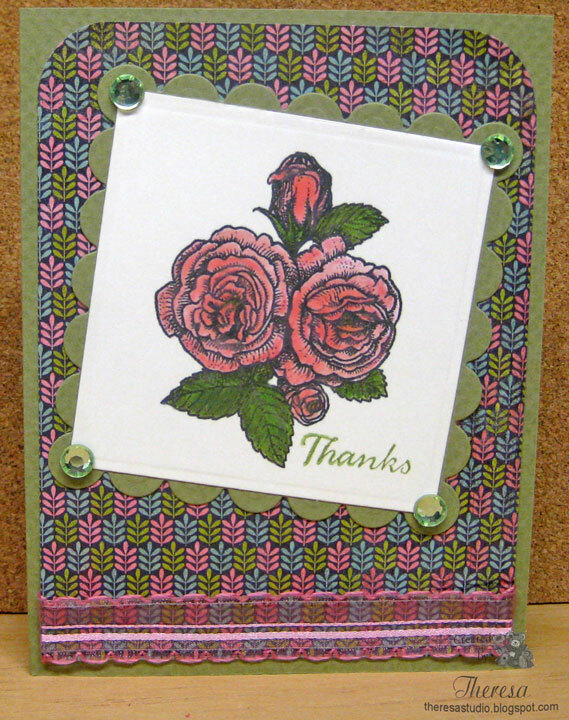 Used a card base of White with a mat of Kraft (Brown) topped with mat of Pink CS partly embossed with CB EF Argyle. Added that perfect ribbon and some brown brads. Attached the image matted on Kraft. Finished with an epoxy sticker that I also found in stash. Digital Tuesday: On the Farm...that's were my chicken belongs. Paper Cutz Challenge: Down on the Farm. You'll find my chicken there. 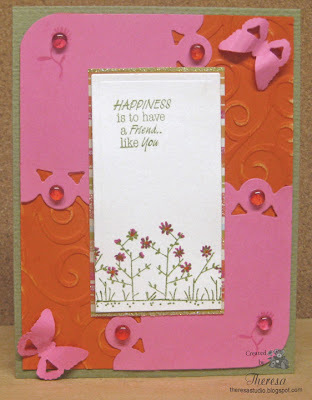 Crafty Cattz Weekly: Use Pink and Brown. Crazy 4 Challenge: Play Bingo using card on right. I bingo'd twice. 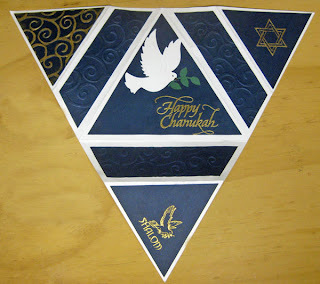 Middle row down-Embossing, Die Cuts, Ribbon. I was making this card for another challenge but did not finish in time to enter so I found some other challenges that it would fit to enter. 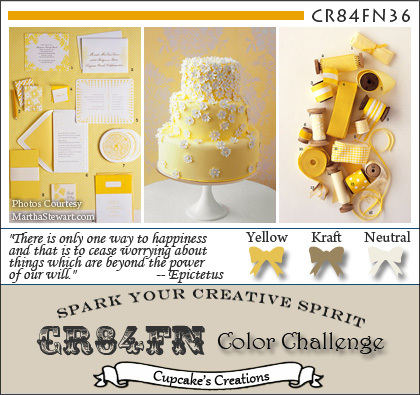 It fits into the challenge at CR84FN which is a color challenge to use yellow, kraft, and natural and more listed below. I used Mark's Finest Papers stamps "Sew What?" which I stamped an image and sentiment on to yellow CS with Memento Rich Cocoa and distressed the edges and added some Brushed Corduroy distress ink. I stamped the scissors ( vintage style) on to Kraft CS with versamark and embossed with Gold EP and then cut out. I also stamped the spool and colored with Copics, cut it out, and wrapped in it thread...some very old thread therefore I consider it a vintage feature too. Also added a real needle and thread it and "stitched" on some buttons. Using a Kraft card base, I arranged and attached all my features including some vintage looking lace. Added a bow to the dress form. Here are the challenges that I am entering. 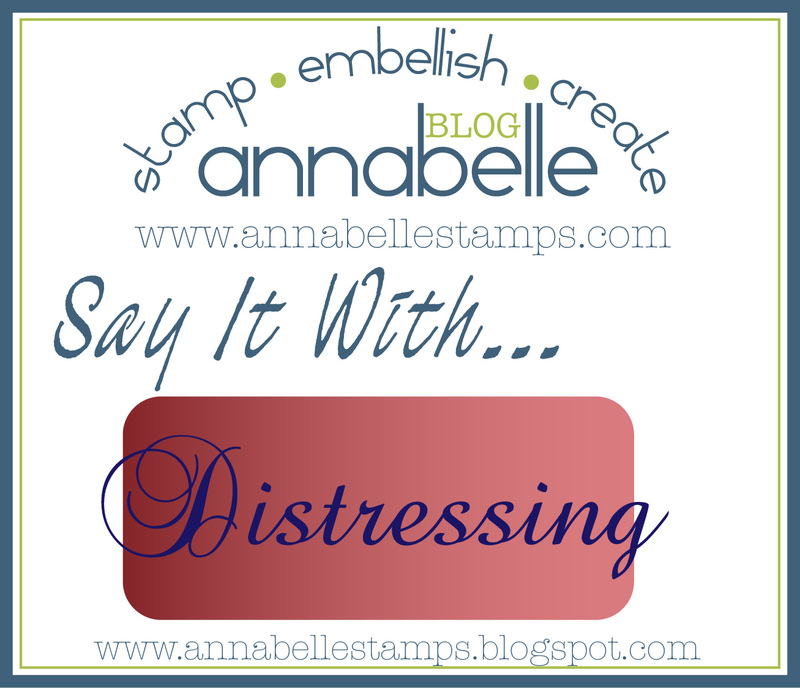 Annabelle Stamps: Say it with distressing. Sugar Creek Hollow: Vintage, shabby chic or primitive card featuring Buttons and Bows. OK! Now I have edited this post to get the challenges added. 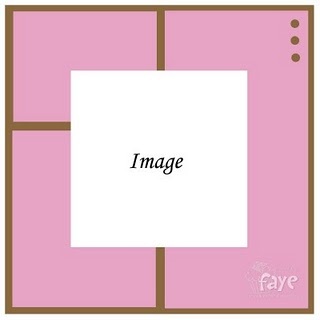 I made this card using the sketch from Card Positioning System shown on left. I will enter it in several challenges. I used the stamps from Paper Pretties "Handyman Set" with Memento Black Ink on White CS and colored with Copics, markers, pencils, and metallic pens. After cutting with Nesties square die, I distressed with Ranger Barn Door ink. Used mustard yellow(My name) CS for card base and a mat of Red/White Check PP from Reminisce. Used strips of design from same PP with food items. Finished with sentiment. Made the Pattern paper do work for this card....no embellies on card. Cards for Men: Anything goes. Certainly a manly card. Simon Says Stamp: Who wants food & drinks? Wags n Whiskers: Outdoor fun. 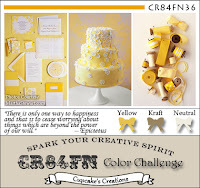 One Stop Craft: Challenge is bold and bright. Think my colors are that! 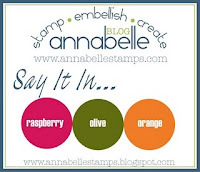 This card is for Annabelle Stamps Challenge ....say it in Raspberry, Olive, and Orange. 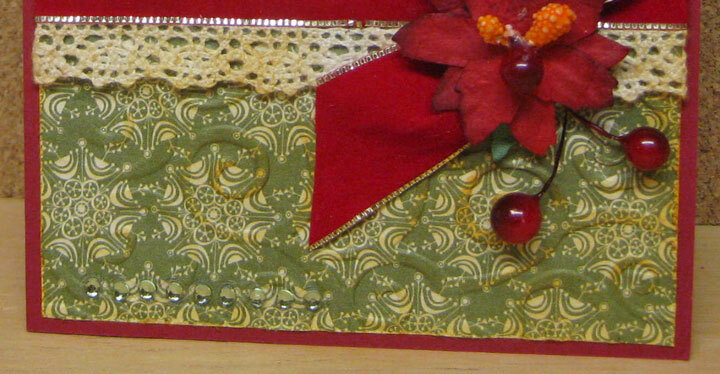 Used card stocks in these 3 colors and a scrap of stripe paper for a mat under the image. Stamps used are Floral Sihouettes and All Thing Grow by Annabelle.Was playing with a new Spellbinders Die Beaded circles. . Added some embossing with CB EF Divine Swirls and some bling using Orange and Raspberry Dew Drops. Threw on some Butterflies cut with Martha Stewart punch. Inks Used are Memento Bamboo Leaves, Rose Bud and cantaloupe. Annabelle: Say it in Raspberry, olive, orange. 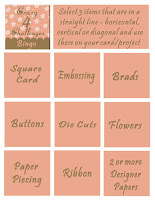 Card Patterns as inspiration for my layout. Fussy and Fancy: Pick any embellishment and show us at least 3 of them. Used 9 Green Rhinestones. Secret Crafter Saturday Challenge: Christmas is Coming. The Ribbon Girl: Create a project that features Ribbon. 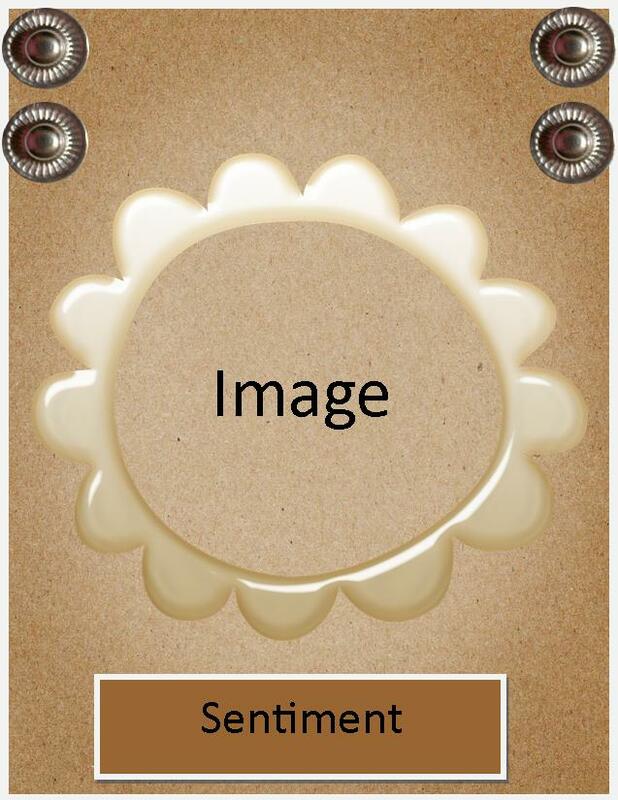 Do you like to focus on one style in making cards or do you like to do a variety? How About a Slice of Watermelon? 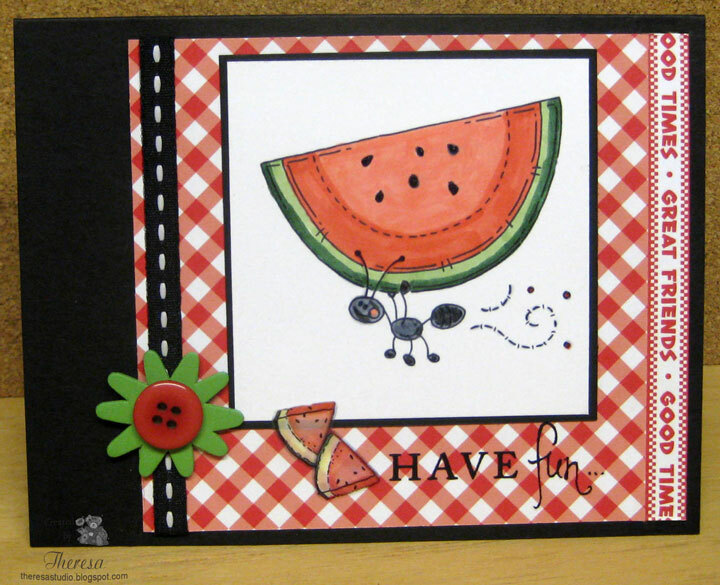 I love this image from Meljen's Designs of the ant walking off with the watermelon. 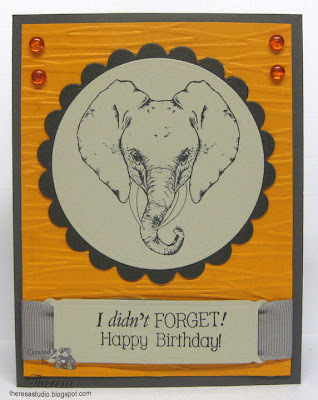 I used this with some tablecloth check paper (Reminisce PP-Picnic Parade) and black CS to create this fun card. Colored the image with Copics and added some Glaze. Used mat and bcard base of Black CS. 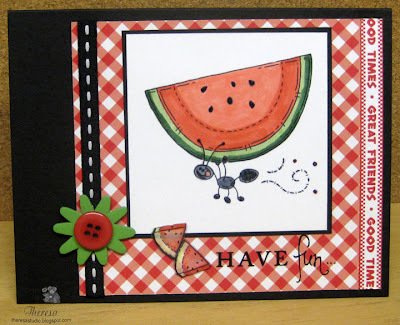 Added a black rub-on sentiment (Making Memories) and some watermelon stickers. Finished with black ribbon with white stitching and a wood flower with a button ( all from stash). Meljens Designs: Use Black. Used "Watermelon Ant"
The Sweet Stop: Use sketch 121 shown on left. Simon Says: Who wants food and drink?"" Fab 'n' Funky: A stitch in time is the theme. Used stitched ribbon. Stamp and Create: Theme is critters. Really Reasonable Ribbon: Keep it Clean. Hope you enjoy some watermelon this summer. Card Partly Opened with 2 points folded back. My card was made with white and navy CS's. I used these stamps: Anita's "Jewish Star", PSX "Shalom", and Rubber Stampede "Happy Chanukah" (inside) which I stamp in versamark and embossed with Gold EP. These are some very old stamps. I embossed the strips of navy for the folds with Cuttlebug EF Divine Swirls. I gold embossed the ones on the outside. 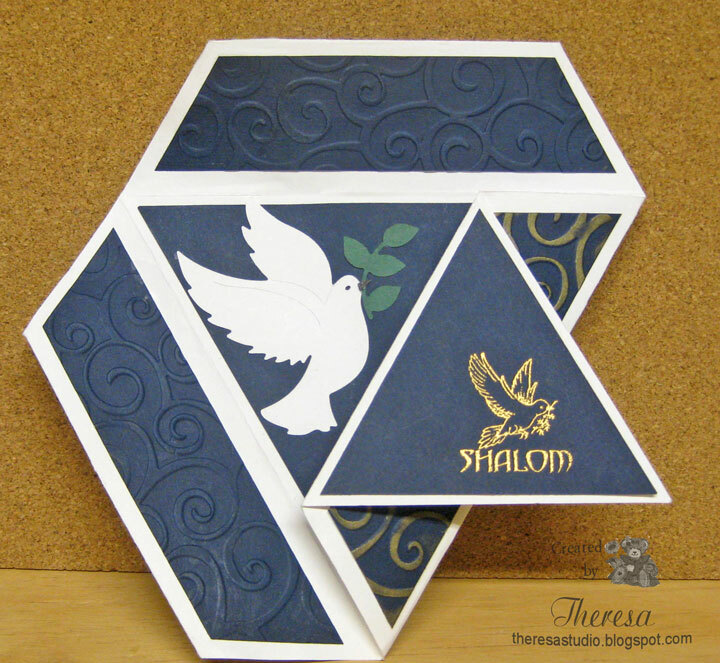 I cut a dove in white CS Cottage Cutz Dove die and placed it on the center of the card. Showing 3 photos to give you an idea of how it looks folded and opened. This was a fun card to make but was a true challenge to complete. Card opened and laid flat. 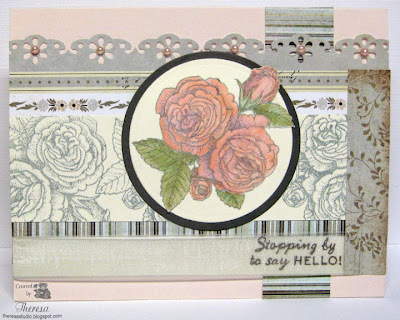 Stamptacular Sunday: Fancy Folds is the challenge. 6 folds in my card. Do You Stack Up Challenge: Emboss it! Used both dry and heat embossing. Alphabet Challenge: N is for Navy Blue plus one other color. Hope that bit of green does not disqualify this card? 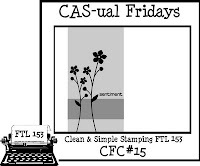 The challenge at Casual Friday is to create a Clean And Simple card using the FTL Sketch shown below. This is a combined challenge with Clean and Simple Stamping....a 2 for 1 you might say. 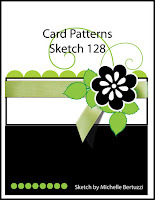 My card also fits in the challenge at Less is More which is to make a One Layer card using ink. I masked off an area and sponged on 3 colors-using Memento New Sprouts, Rich Cocoa, and Summer Sky. I then stamped the images over this inked space using Memento Bamboo Leaves, Tangelo, and Rich Cocoa inks.. Stamps are from Flourishes "Summer Blossoms" and Sentiment from MFP's. Colored in the blossoms with orange pencils. Added some details to the "fence" with brown pencil and sparkle to the dragonfly with Sakura Clear Star pen. I was going through some digital images that I had printed out and came across this one from Sassy Cheryl called "Digital Hearts and Bees" and thought it would be perfect for her challenge theme "What's bugging you?" I colored the image with Memento markers, added some Clear Star glitter highlights and used some Glossy Accents on the bees and bugs. Cut it out with Nesties Label 4 Die added twine and lady bug button and matted on green CS also cut with Labels 4 die. 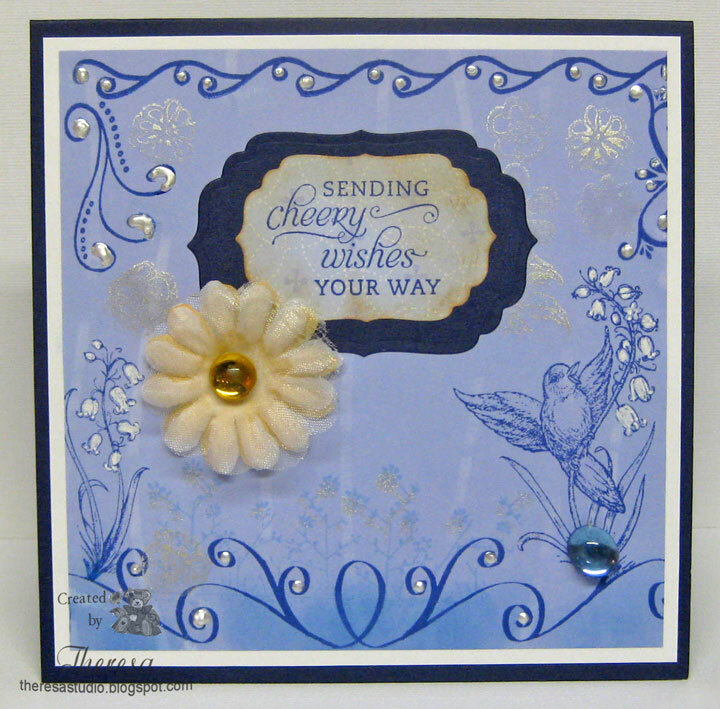 For the card base I used Glossy White CS which I embossed with Cuttlebug EF Stylized Flowers and highlighted the raised area with Memento New Sprouts ink. A fun card to use to say Hi to someone. 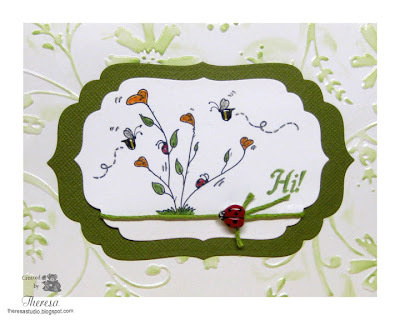 Sassy Cheryl's Challenge Blog: Going buggy-use designer paper that includes bugs, or a sentiment about bugs, or a Sassy Cheryl digi that includes bugs. 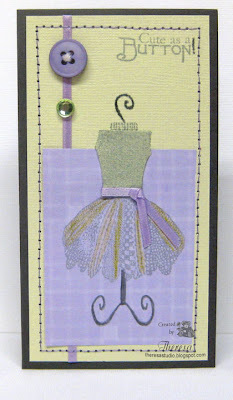 Scrap Creations: Challenge is Bingo....used row with Glitter, Die Cut/Punch and Button. 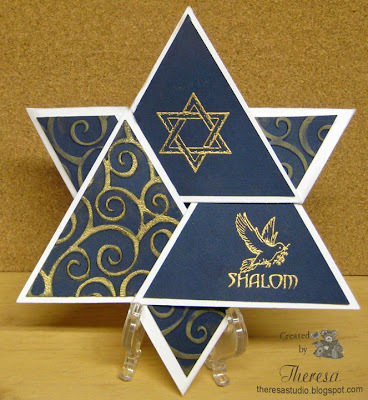 Paper Pretties Wednesday Challenge: Use die cuts. Hope nothing is bugging you today and your day is pleasant. At There's Magic in the Air this week, Jennifer challenged us to use any type of animal image and go wild on our creativity! 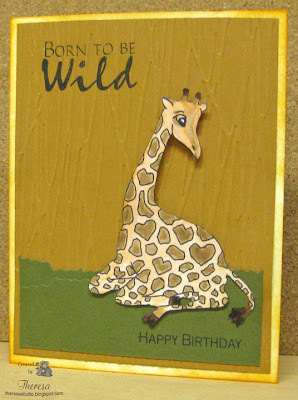 I used a Paper Cupcakes image 'Think Love" which is this cute giraffe. I colored him with Copics and cut him out and attached him to my card with dimensionals. 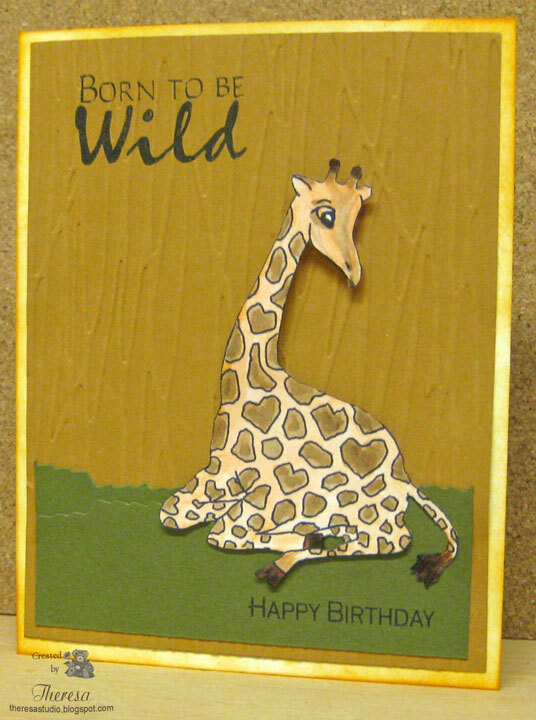 I used stamps from Mark's Finest Papers "Big Cats" for the sentiments. Other supplies used were Memento Tuxedo Black ink, Ranger Wild Honey Distress Ink. White, Green and Brown Cardstocks, Decorative scissors, and Cuttlebug EF Forest Branches. There's Magic in the Air: Use an animal and go wild. Anything Goes Challenge: Theme is Birthday/Celebration. Cards For Men: Clean and Simple. 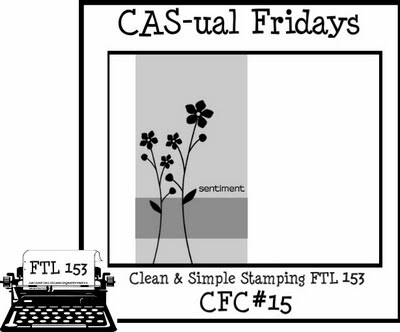 Crafty Catz Weekly: Emboss it. Embossed background Mat. 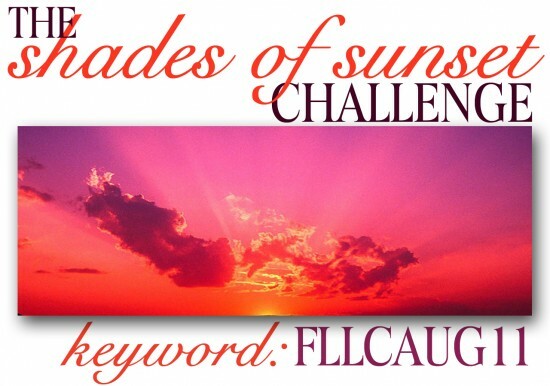 One more Flourishes challenge today- the Shades of Sunset Challenge.This color challenge is open to interpretation! 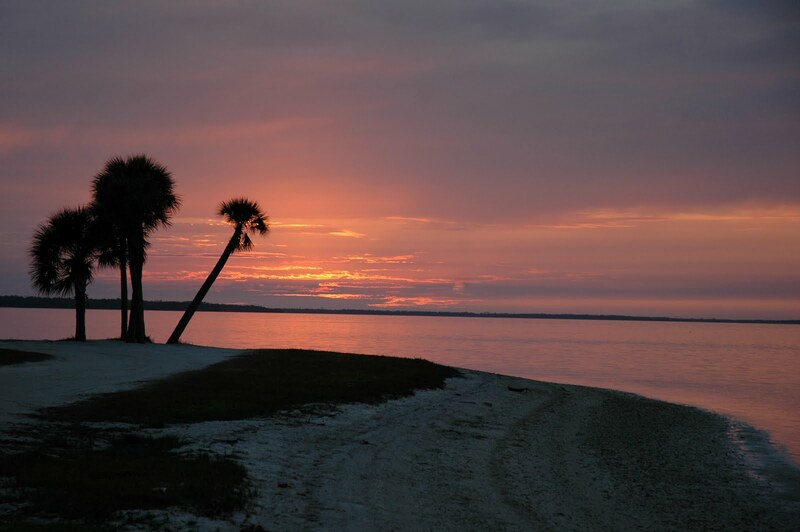 Challenge: "Sunsets are so unique – some have mostly shades of red and orange, others can light up the sky with purple and pink hues!" We are to pick our favorite sunset colors and share in a project. I did this card by using a photo that my husband had made a few years ago. I cropped out a section of the picture and used as a background for my card. I stamped a Zinnia using a Flourishes stamp directly on the picture printed on White CS. I used Versamark Ink and embossed with Ranger Copper EP. I stamped the sentiment in the same way. Love how this came out. Used a grey CS card base and a mat of Copper Metallic CS. Added no other embellishment....just let the stamps, both from Zinnias Stamp Set by Flourishes, be the stars of the card. 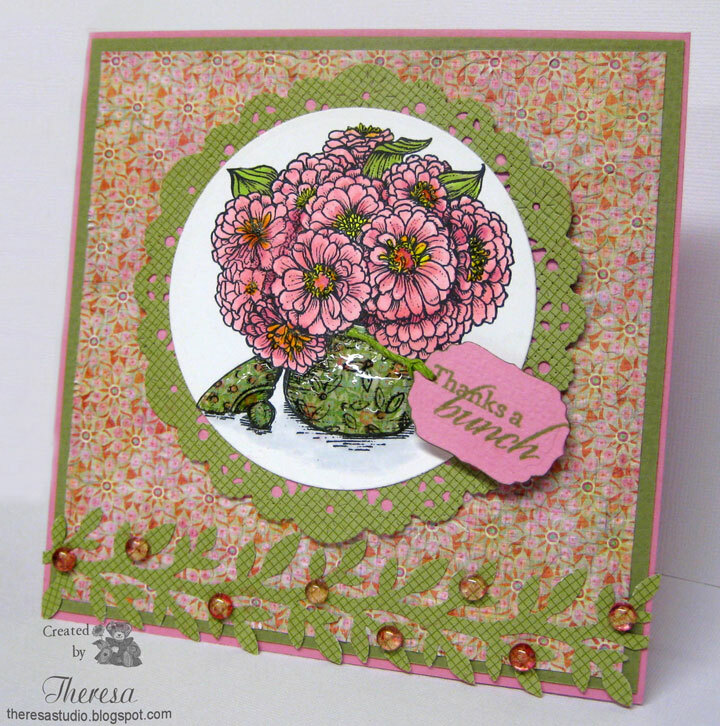 The sentiment and zinnias just seem to cry out to be on this card when I was looking through my stamps. It took be a while to come up with the concept of this card but am pleased with the result. Below is the original photograph that I used as inspiration for my card. This was a sunset at the causeway at Captiva Island, Florida. Thanks for stopping by for a visit. Love all your comments, Theresa. Another Noon Time Challenge for Flourishes. Welcome to my second post for the Flourishes Release noon time challenges. 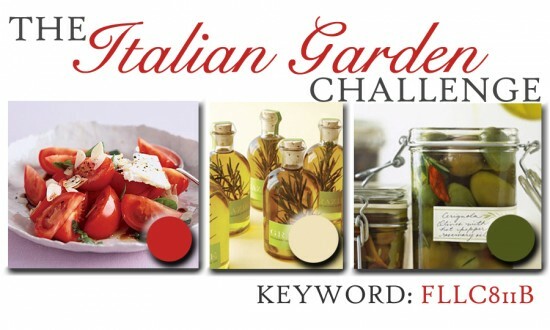 This one is the Italian Garden challenge - to use the colors of Red, Green, and Neutral - the lush colors of tomatoes, olives and olive oil. There is nothing really Italian about my card but I did use the right colors. I ended up with a very clean and simple card and a Christmas card too.... not my original plan but it just happended that way. 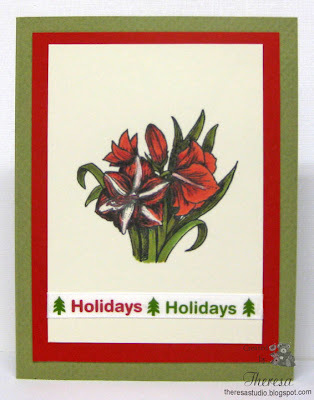 I used a Flourishes stamp the Amarylis from "A Year in Flowers"....perfect for coloring red and green with Copics. Stamped with Memento Tuxedo Black on Ivory CS. Matted this on Red Cs and attached to a Green Card Base. Added the ribbon from stash to finish the holiday theme. As I said...Clean and Simple. 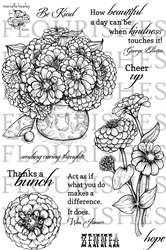 Three newly released Flourishes stamps! 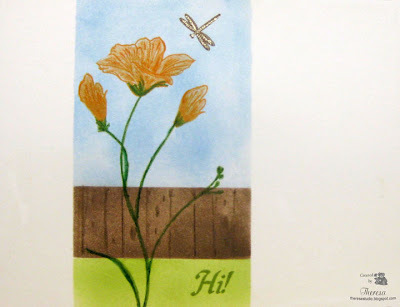 Flourishes has released some beautiful stamps this week and I would love to have them all. I made this card for one of their noon time challenges and I am hoping to win the prize of all their new stamps. 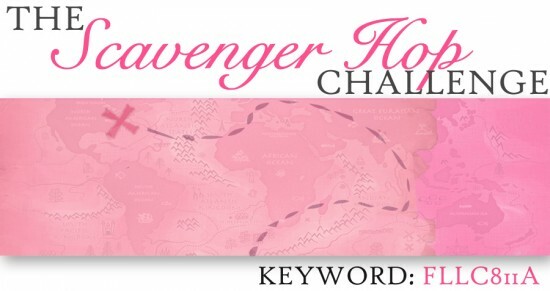 This challenge is to go on a scavenger hunt to each one of the 8 designers’ blogs and use the different ingredients that you find on the hunt on your challenge creation! I am using white, bling, decorative paper, floral, green, square, pink, and ribbon to make my card. (Guess I gave away the ingredients). What a fun scavenger hunt and challenge! Speedy the Cat's Friends challenge this week is to make a card any shape or size other than the standard 4 1/4" x 5 1/2". I made this card using a sketch from Sweet Sunday which I flipped and used colors from CR84FN challenge. Using a Grey Card Base, I stitched on a mat of celery CS(Bazzill)...thought that was appropriate since my theme seems to be sewing ...and purple ribbon on the side. Added a rectangle of lavender DP (unknown) to which I stamped the dress maker form from Mark's finest Papers "Sew What" set using Memento London Fog and paper pieced the bodice with celery CS also stamped with the grey ink. Added some lavender ribbon and green coloring to the skirt. Finished with a lavender button and green gemstone. Stamped the sentiment also from the"Sew What" set in London Fog ink. Speedy the Cat's Friends Challenges: Make a card any shape or size other than the standard 4 1/4" x 5 1/2". 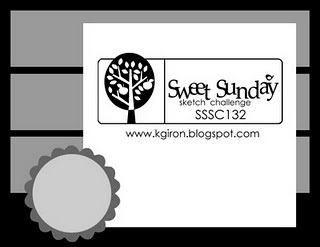 Mine is 3 x5.5 "
Sweet Sunday Sketch: 129 shown above.